Nutrition Solutions is owned and operated by Jocelyn Hunter Clarke. 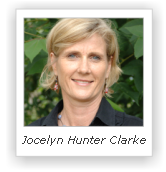 Jocelyn Hunter Clarke is an Accredited Practising Dietitian and Accredited Nutritionist with a Degree in Science, and a Post Graduate Diploma in Nutrition and Dietetics. She has over fifteen years’ experience in variety of roles and was a Registered Nurse for 10 years before becoming a dietitian. She has a special interest in gastrointestinal disorders, food intolerance and children’s nutrition. She has a particular interest in Functional Gut Disorders such as irritable bowel syndrome, and regularly attends the Monash University Department of Gastroenterology research seminars. Before opening her private clinics, Jocelyn was a lecturer at Queensland University of Technology in the School of Public Health. She has also been a guest lecturer at Griffith University and involved in the supervision and tutoring of Nutrition & Dietetic students completing their Masters degree. Jocelyn is a member of the Dietitians Association of Australia (DAA), is committed to a program of continuing professional development and remains up to date through the Accredited Practising Dietitian program. She is currently an active member of the professional mentoring program with the DAA. She is a member of Diabetes Australia, Coeliac Society, and Australasian Society for Obesity. She is an active member of the DAA Food Allergy & Intolerance Special Interest Group and is committed to evidence based practice. Jocelyn has three young children and so has a personal understanding of the challenges parents’ face, particularly when it comes to the practical issues around feeding children, especially children with behavioural or developmental problems. She is pasionate about providing clear, practical and realistic advice.